So our little vegan loves Sauerkraut and I tend to look for recipe ideas that include ingredients she likes in hopes that she will be less reluctant to try the finished product. When I saw this Czech Sauerkraut Soup last year during Vegan MOFO from a Czech Vegan (in America) I knew I had to try it. I have never had a sauerkraut soup but it looked and sounded great! 1. In the original recipe it was mentioned that to make it more authentic it should be eaten with rye bread and that you could add your favorite vegan sausage. I opted to combine the two suggestions and made vegan sausage and rye balls. Hubby says they are his favorite meatless balls ever and they were so easy! Recipe Below. 2. Instead of using more oil I sautéed my onions in the oil I cooked the balls in. 3. I didn’t have vegetable broth so I used water and 1 tsp of Better than Bouillon No Beef Base. 4. I used three cups of sauerkraut instead of two because that is what came in my jar. To see the soup recipe go here. Mix the chia seeds and water and set aside for 15 minutes. Cut or tear the toast into small pieces. In a large bowl mix Sausage, chia mixture and toast with your hands. Roll mixture into balls. We were having too much fun and forgot to measure but ours were bigger than bite size. In the pot that you plan on making the soup in heat up oil (enough to cover the bottom) on medium heat. Cook balls in oil until lightly browned. Add more oil if needed. Place balls on cookie sheet covered with parchment paper. Set aside. Fry onions for soup in left over oil. Scraps from the balls are okay, they will add flavor. Preheat oven to 375 degrees. Bake balls for 30 minutes turning half way through. I put my balls in the oven when I added the potatoes to the soup. Serve soup with balls. Enjoy! Thanks Czech Vegan! My house smells amazing right now and the little vegan loved it! Gallery | This entry was posted in An Ode to Vegan Bloggers MOFO 2012, soup. Bookmark the permalink. Love sauerkraut, too! Thanks for sharing your recipe for sausage rye balls. I just got chia seeds recently and have been looking for uses. The sausage rye balls are really super easy also. I started using chia a few months back and am addicted! Sausage-rye balls! What an awesome idea! This whole thing looks right up my alley…. I think I remember seeing that sauerkraut soup post last year, but somehow I never got around to making it. Maybe this year! Not sure if my first comment posted or not– sorry if this is a double-comment! I just wanted to say that this looks great, and your sausage-rye balls sound incredible. I saw the sauerkraut soup recipe last year and somehow I never made it… maybe this year! It is really good and I will be making it again. It is too easy not to! I’m going to have to try those sausage-rye balls ASAP! 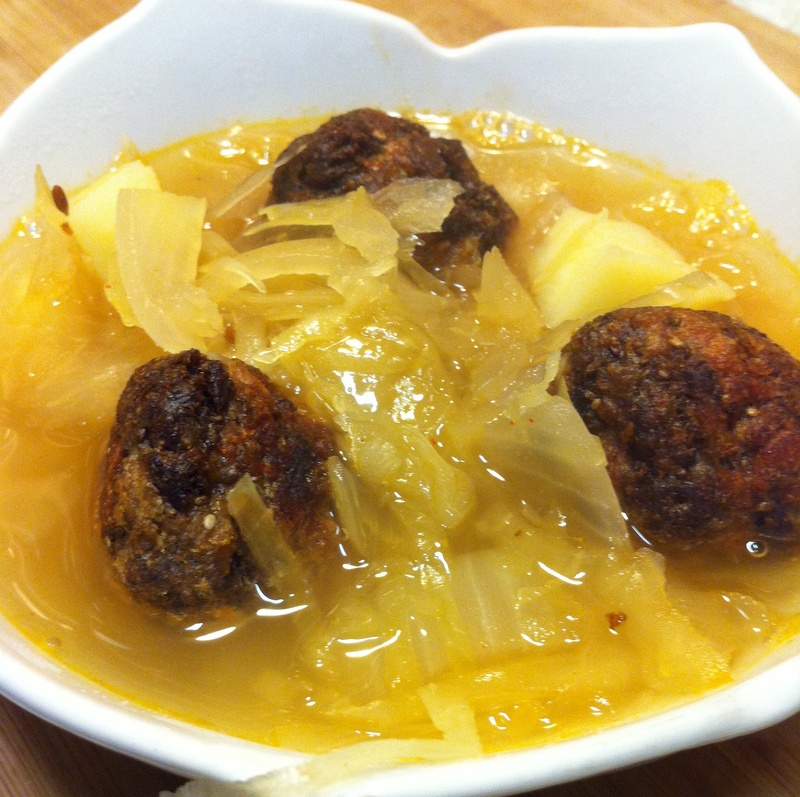 I love sauerkraut soup & your version looks delish! Oh yum, those meat(less) balls sound delicious! I love all things sauerkraut, so this whole recipe is for me!